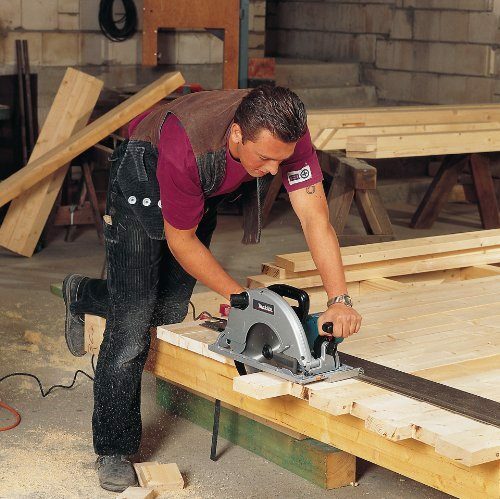 ​A miter saw is a useful tool when you need to make cross cuts or miters. Compared to a standard table saw, you can make quicker, more accurate cuts. While the miter saw is a handy power tool, it is also dangerous to operate without knowing what you’re doing. To protect your fingers, you should explore the most common safety recommendations for using a miter saw. ​The top of the range miter saw brands will usually come with a number of important safety features however, there is no substitute for careful and responsible usage. The following list of safety tips can help you to reduce the chances of injury when using a miter saw. Always make sure that you are free from distractions and are concentrating 100% on what you are doing. Whenever you use a miter saw, you should first put on the necessary protective gear. Do not make a single cut without putting on goggles and ear protection. Standard eyeglasses do not count as protective eyewear. You can find safety goggles that are large enough to fit over your glasses. These goggles are often made from a flexible plastic to prevent shattering when struck by a projectile, while standard glasses can crack and leave pieces of glass in your eye. Ear protection is needed to protect against prolonged exposure to loud sounds. You can wear either ear muffs or ear plugs, depending on whichever option is most comfortable for you. Some experts also recommend that you wear gloves, while others advise against it. Wearing gloves may limit your tactile response and ability to maintain a firm grip. If your fingers get too close to the blade, the thickest gloves may not protect against injury. Along with the protective gear, you should avoid wearing any loose-fitting clothing, jewelry, and other items that may dangle over the blade. Before you turn the miter saw on, you should inspect the machine. Double check to ensure that the guards are clean and in place. You should also check the blade fasteners. While inspecting the saw, you should inspect your work area. Clean away any sawdust, debris, and pieces of wood that may be lying around. These objects can create hazards while you’re cutting. If you’re wearing the right gear and have finished inspecting the miter saw, you can start cutting. When you make your cuts, use the following safety tips to reduce the risk of injury. If possible, use clamps to keep your material secured to the table. If you cannot use clamps, you need to maintain a firm grip on the material throughout the entire cutting process. You also need to keep fingers six inches away from the blade. Getting your fingers too close increases the chances of cutting one of them off. Following this safety tip also means that you should avoid cutting small pieces, as you need to get your fingers closer to the blade. After every cut, wait for the blade to completely stop spinning before you raise it. Besides helping to prevent injuries, this step can help make smoother cuts. As a final safety tip for using a miter saw, make sure that you read the instructions that came with the power tool. Miter saws from different manufacturers are not identical. They may have features that require additional safety measures. Read through the instruction manual before you make your first cut, and remember the safety tips discussed. 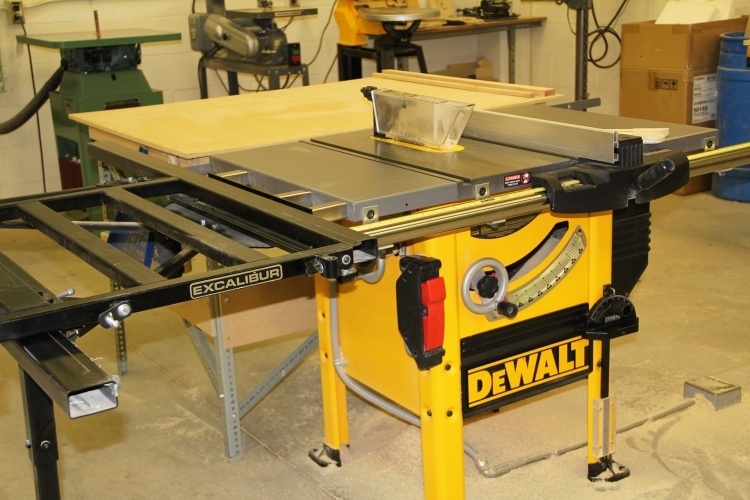 A table saw can be used for a wide variety of projects, making it an essential tool in your home workshop. When you use a table saw, you need to remain aware of the fact that these machines can easily remove fingers and cause major injuries, if you are not careful. Before you start cutting, you should ensure that you know how to use the saw and follow all safety precautions. You should know the basic parts of a table saw before you turn it on. While these tools may seem simple, knowing how the parts work together ensures that you can follow the remaining safety suggestions. 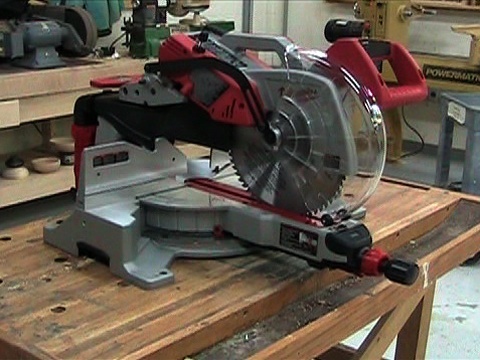 Table saws are comprised of a saw connected to a table top. The typical size of the table is 3 x 3 feet. However, larger sizes are available. The table is often made from aluminum or steel and designed to sit on a metal cabinet or stand. The fence is a part that you will hear mentioned frequently in instructions and safety tips for table saws. The fence is a guide that runs parallel to the blade to keep the material that you are cutting at an even distance from the blade. The blade is used to cut various materials, while the blade insert determines the gap on each side of the blade. Table saws are also equipped with a blade height adjustment wheel and a blade angle adjustment lever for adjusting the type of cut. The clothing and protective gear that you wear is just as important as knowing the various parts of the table saw. Wear short sleeves and avoid any baggy clothing or jewelry that may get caught in the blade. You should also wear proper protection for your eyes and ears. Wear protective goggles to protect your eyes from pieces of flying debris. Wear earplugs to protect your ears from the high decibel levels of the saw, especially if you’re going to be cutting for several hours. While wearing gloves may seem like a good method for protecting your fingers, gloves can increase the risk of injury. Wearing gloves can reduce your gripping power and your ability to sense exactly what you are doing with your hands. When using a table saw, keep the floor in front of the machine clean. Sawdust may create a slipping hazard, increasing the risk of falling into the blade. You should also stand with your feet slightly apart to increase your balance. Maintain a comfortable stance and avoid locking your knees. Once you have the right clothing and stance, you can start cutting. Make sure that the material is not touching the blade when you turn it on. Guide the material toward the blade, while keeping the material flat against the table. You should also use the proper fence. When making rip cuts, use the rip fence. When making crosscuts, use a miter gauge. Along with these tips, you should read the instruction manual comes with your table saw. Review the parts, guidelines, and safety instructions provided by the manufacturer, as some of the details of operating a table saw can vary based on the model. Wood Jointer vs Wood Planer – Which One Do You Need ? ​Crafting furniture, cabinets, and other forms of woodworking are great hobbies. However, they are hobbies that require the right tools for each specific project. There are dozens of different types of saws and power tools that make woodworking easier, including the wood planer and wood jointers. ​The planer and the jointer share several features, which leads some people to mistake these tools for each other. While these tools appear similar, they serve different functions. How Does a Wood Planer Work? Wood planers have been used for hundreds of years. However, modern planers such as the DeWalt DW735 or DW735X are equipped with a cutter head that is used to plane the surface of a wood board. Basically, the planer cuts boards to the right thickness. It can also be used to help create evenly parallel sides on a board. ​How Does a Wood Jointer Work? A wood jointer is used to ensure that your boards are flat and even. You place your wood on an infeed table. It then passes over the cutting blades before passing to the outfeed table. You can repeat this process to smooth all sides of the board. 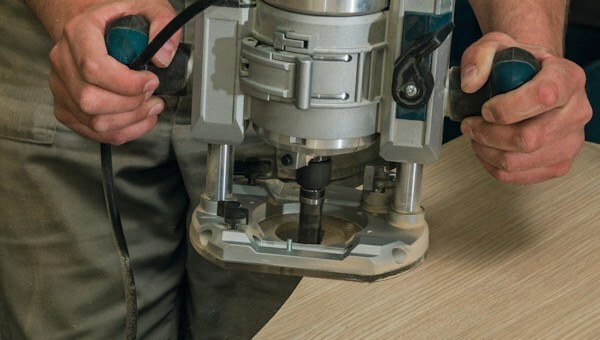 ​Why Do You Need a Planer or a Jointer? ​Both the wood planer and wood jointer are massive power tools that are used for milling lumber. While you can perform these tasks by hand, hand-milling requires a lot of practice to master. These power tools are used for the same basic reason. When you purchase lumber, it is hardly ever straight or perfectly flat. You will typically find warps and defects somewhere along the wood. These defects can limit the quality and structural integrity of your finished woodworking project. Typically, when using a planer to cut a board to the right thickness, you need one flat side as a reference. This is usually achieved with a jointer. You can create one smooth, flat side with the jointer and then use the planer to create the parallel flat side while cutting the board to the right thickness. ​A jointer may be the more useful tool. You often need to start with a jointer to create a flat surface before you use a planer to cut an uneven board to the right thickness. Using a jointer, you can create completely even faces on all sides of a piece of wood. If the edges or surface of the wood that you want to cut is not flat, the jointer can easily help smooth out the board. The planer will not solve the problem. It will simply follow the bend as you reduce the thickness of the board. ​While the jointer is recommended for a variety of scenarios, there are also situations where a planer is preferred. If the wood that you purchase is not the right thickness, the wood planer provides an efficient way to get the thickness that you need. A wood planer is also useful for creating a parallel side. For example, when crafting a table, a door, or a window frame, you want each side of the wood to be identical. The planer can help create this parallel side if the board is already flat. If you notice defects, you should first use the jointer. You may also use a wood planer when you need to get rid of minor surface imperfections. For example, the board that you are cutting may have minor dents or scratches. The planer can quickly create a smoother surface. ​Which Tool Should You Choose? ​In the end, the tool that you choose depends on the types of projects that you enjoy completing. The wood planer is mostly used for cutting boards to the right thickness and for creating a parallel surface. However, if the board is not flat, you need a jointer, or you will end up with parallel sides that are not equally bent or curved. The jointer is the more versatile of the two tools and serves the most functions. You can use it to create flat pieces of wood from boards that are twisted, cupped, or bent. However, these tools also go hand in hand. There are many situations where you may want both a wood planer and a jointer. ​If you are in the market for a new table saw then you may be a little bit bewildered by all of the different types of table saws that are available. Some are small and compact whilst others are big immovable cabinets. There are different rip capacities and various in-feed and out-feed configurations. ​Because they are designed to be portable these kinds of table saws tend to be a lot lighter and will generally have a lot smaller capacity and power than a stationary saw. ​They are usually powered by a smaller 15 Amp motor and have a no-load speed range of between 3,500 and 5,000 rpm. Bench top saws are usually considered to be the lightest and most portable of all table saws. They can of course be mounted on a stand or rolling stand but most users will just leave then mounted on a work bench. Saws like the DW745 and DWE7480 are extremely popular choices here. Some people will mount them in a small rolling cabinet that is easy to move about a work shop. Generally speaking they will have a much smaller rip capacity and will be built to a much less sturdier design. All of this is in the name of weight saving so there is a trade of for that added portability. ​Job site saws are a step up in terms of build quality to the smaller bench top saws. They are most commonly used by contractors on a site and will usually have some form of stand. ​They will most certainly have a larger rip capacity and will be built from much heavier components. The rip capacity is normally some where around 24". The fence will usually have a much more accurate fence adjustment. The motors too are usually a lot more robust and can with stand a lot more use on a busy job site. They are normally sold with a stand as part of a package. The stand can either be a normal folding leg only design or they may have what is called a rolling stand. A rolling stand will not only have folding legs it will also have integrated wheels on the frame to make transport much easier. ​Most stationary saws will generally be refferred to as a cabinet type table saw. Although there are a couple of other types like a contractor or hybrid saw they are rarely used today. Cabinet saws are usually the larger table saws that most people are used to seeing in a woodworking shop or large garage. They are considered to be the absolute best in terms of features, accuracy and power. Most professional wood shops will make a considerable investment in their cabinet table saw, and they would expect the saw to put in several decades of faithful service. ​Given that weight is actually a help here and not a hindrance, cabinet style table saws are made from only the best materials. All of that extra weight is what helps them to be sturdier, stronger and a lot more capable at cutting. These saws along with hybrid saws lie somewhere in between a smaller contractor type saw and a full blown cabinet saw. ​Although the are somewhat portable they are usually only used on a site that will be worked on for some time that requires a bit more power than your average portable saw. What Is A Wood Planer and How Does It Work? ​Wood planers were traditionally hand tools that were used to flatten or shape wood. They had a removable blade fixed in a wedge that could be pushed along a piece of wood to help flatten and smooth them. Although still commonly used today for larger jobs hand planers have been replaced by powered planers. Powered planers are usually referred to as "thickness planers"
These powered planers can be used as either hand held corded power tools or they can be much bigger pieces of equipment like a portable bench top planer or even a more fixed solution such as a stationary cabinet planer. ​What Is A Wood Planer ? ​The primary job of all wood planers regardless of whether they are powered or not is to shape and smooth out uneven pieces of wood. This can mean shaping only a small part of the wood to remove a protruding knot or any other blemish. It can also mean cutting the entire top surface of a piece of wood down to certain thickness so that the board is as symmetrical as possible. Probably the most common type of planer found in a busy woodworking shop or on a building site is a portable bench top planer. ​Planers such as the DeWalt DW734, DW735 and DW735X are used extensively to smooth out rough boards before being used on thousands of job sites across the country. These types of planers are easy to use and with the addition of in-feed and out-feed tables they can usually be quite good at eliminating snipe. ​How Does A Wood Planer Work ? ​All wood planers work by running a blade along the surface of the wood preferably in the direction of the grain. A thickness planer works by passing the board underneath a rotating cutter head. Either side of the cutter head are an in-feed roller and an out-feed roller. ​The in-feed roller is used to grip the board and pull it along the underneath the cutter head at a uniform speed. The cutter head has a number of knives mounted on it. It are these knives that actually cut the surface of the wood as it passes along under the cutter head. The out-feed rollers are then used to pull the board through out from the cutter head where it gets ejected. A good thickness planer will generally have both an in-feed and an out-feed table. The longer these tables are generally the less chance there is of producing snipe on the board. Snipe is when the planer ends up cutting a little bit more out of either the end or the beginning of the board. ​When in-feed and out-feed tables are used it helps to create a longer surface that the board is lying on. Assuming that they are set up correctly the longer surface means that the length of surface the board is pulled over is as flat as possible. Once the planer and feed tables are correctly aligned the next task is to set the cutting depth of the cutter head. Depending on the type of planer that is used you either adjust the planing platform that the boards sit on or you adjust the cutter head depth. Once the planer has been setup correctly and powered on the boards are fed in on the in-feed table. Be careful to ensure that the board lies as flat as possible on the platform. One important thing to note that in order for a planer to smooth a side correctly the opposite side that sits on feed tables must already be perfectly smooth and flat. Depending on the planer that you have the speed at which cutter head spins at can affect what kind of finish you will get on your piece of wood. Generally I tend to favor a two-speed planer as it gives you a lot more versatility when dealing with different varieties of wood. ​10 Inch vs 12 Inch Miter Saw - probably one of the first questions you'll have to tackle when purchasing a new miter saw. 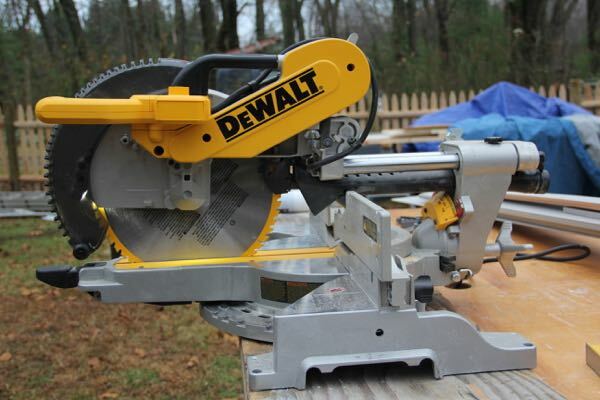 ​What size miter saw will you need ? ​If you buy a 10 inch will you regret it and want a 12 ? ​A new miter saw is a pretty serious purchase for most woodworkers especially if you have never owned one before. With 10 inch saws running at a significant discount to some of the high end 12 inch miters, price is usually one of the biggest factors that lead people in their decision. Bear in mind that there are some smaller and larger saws available from 8-1/2 inch all the way up to 15 inch, however the 10 and 12 inch saws are the most suitable for the majority of people. ​Everyone will have different needs when it comes to what kind of miter they will need. Are you a beginner just about to purchase their first saw or an experienced woodworker that has lots of projects on the go? ​Although it is the most obvious thing it is not only the size of the blade that separates the two. Below you find a brief summary of each type and their strengths and weaknesses. The smaller blades are usually much easier to find in your local hardware store. Not only do they have much better availability they are also usually a lot cheaper. Depending on the brand a 10" blade can be almost half the price of a similar 12". If you have a lot of projects and use your saw quite a lot this can mean a significant saving on on-going replacement blades. If you prefer to have your blades sharpened a few times before retiring them the 10" ones are also a lot cheaper to have them re-sharpened. Smaller blades spin faster when used with the same motor. For example through out the DeWalt Miter Saw range the smaller DW717 10" saw will spin at 5,000 RPM versus the larger DWS779 at 3,800 RPM even though both saws have a 15 Amp motor. A faster blade will generally give much finer and more accurate cuts than a larger one. Given the smaller radius of the 10" blade it is less likely to wobble at maximum RPM. The major drawback of course of a 10" miter is the reduced cutting capacity when compared to a 12" saw. ​For the 10" saw you will usually get about 6" whereas some of the better 12" can handle up to 16". ​12" miters are have a number of clear advantages over the smaller 10". Firstly the cutting capacity is usually much larger, thanks in part to a much longer swing arm. There are also capable of a much higher overall work rate than the smaller 10". 12" saws are built a lot heavier and usually the components can withstand a lot more abuse and heavy daily usage than the smaller saws. ​The biggest negative point to the larger saws is of course the cost. They are generally a lot more expensive to both buy and fix if something goes wrong. As outlined above blades are also more expensive to replace and to have sharpened. The larger saws are also a lot heavier and bulky. This really isn't an issue if your saw is permanently mounted on your work bench. However, if you are moving it around a lot from job site to job site then it can be an issue. Purchasing a good miter saw stand can make life a lot easier but does add to your overall expenses. ​Which One Do You Choose? ​Ultimately the choice between a 10 or 12 inch miter saw will depend on your exact situation. If you are a beginner purchasing their first saw and don't need a larger cutting capacity then the 10" saw is a good option. However if you work as a busy carpenter on site and need a powerful saw that has a large cutting cpacity that can slice through crown molding all day long then the 12" saw is the one to get. Miter Saw vs Circular Saw – Which One do you Need? ​Miter Saw vs Circular Saw which saw is right for your power tool collection and do you really need both? ​Although most experienced woodworkers and DIY enthusiasts can get the job done without the need for power tools in their garage, modern reliable powered saws can certainly make your cutting jobs not only faster but also more accurate. 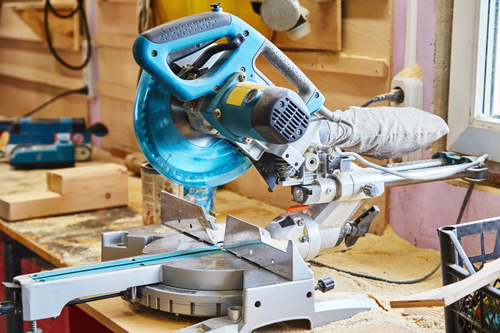 ​Both the miter saw and the circular saw ​have their strengths and weaknesses. Below we'll take a brief look at what exactly each saw is and when to use one over the other. Which one you choose will ultimately depend on your needs but in short a miter saws are used for cross cutting lumber and crown molding whereas a circular saw is best used for making rip cuts in sheets of wood. The miter saw is usually one of the biggest purchases you are likely to make. And although you don't absolutely need one they can make certain jobs a breeze. A miter saw is basically a spinning saw blade on a fixed arm. The fixed arm can allows the blade to be lower precisely from above allowing you to cut through lumber at a perfect 90 degree angle just like a chop saw. However a miter saw can make cuts at a variety of different angles. The "miter" in miter saw allows for the blade to cut across the lumber at different horizontal angles. The miter cut is always made at 90 degree to vertical. Look at it this way a miter cut is any other angle other than 90 degrees across the width of a piece of wood. Miters can also be used to make bevel cuts. A bevel cut is when you make a cut at an angle that is 90 degrees along the thickness of the wood. See the image below for the different types of cuts an mite can make. ​Miter saws are commonly used to make quick and accurate cuts across pieces of lumber. They are used most commonly to cut crown molding at the correct angles that allow for a seamless join especially in corner pieces. One major disadvantage of a miter saw is that the are big and heavy and significantly less versatile than a circular saw. ​The circular saw is a lot more common than the miter saw. They are significantly cheaper to purchase and can be bought in either corded or battery powered(cordless) models. A circular saw is most effective at making long rip cuts in sheets of wood. So if you aim is to cut lots of sheets of plywood or dry wall then the circular saw is the best tool for the job. Although you can make all of the same angled cuts with a circular saw as you can with a miter saw, they will always be less accurate. What they lack in accuracy however they make up for in versatility. A circular saw can be used just about anywhere as they are not fixed to a base or work bench like the miter saw. ​DeWalt vs Hitachi miter saw - two of the most popular miter brands in use today. ​At the mid range of the miter saw market is generally where you will find the best trade off between price and quality. ​At the higher end of the market, although manufactured to an extremely high standard brands like Festool are usually 3 times the price of the offerings from the more popular mid range brands such as DeWalt and Hitachi. Both brands have offerings in the 10 and 12 inch categories. Usually the first thing to consider when buying a new miter saw is just how big a blade will you need. The larger 12 inch miters are always going to be a lot more flexible than the smaller 10 inch. Personally I have always owned a 12 inch saw. The 10 inch however does have it's uses, they ​are generally better at making cleaner cuts than the larger 12 inch. So if you do a lot of fine woodworking and do not need to cut large more basic pieces such as crown molding then it is best to stick to a 10 inch. The other thig of note is that a lot of 10 inch miters are only single bevel whereas the majority of 12 inch miter saws are double bevel. ​The average handyman or tradesman working on a busy jobsite will generally favor a 12 inch miter saw. Both Hitachi and DeWalt have multiple offerings in this size. DeWalt have the DWS779 and DWS780 along with numerous older models and some cordless battery powered offerings too. Although the DWS780 is the top of the line model from DeWalt I feel that the DWS779 is actually better value as it is commonly up to 50% cheaper than the DWS780 the only difference being the guide system. Hitachi have the C12RSH and C12RSH2. Although you will commonly see the C12RSH on sale online and in many department stores it is important to realize that it is a discontinued model. Between the DeWalt and the Hitachi the DeWalt is the superior saw. The most obvious difference between the two is the DeWalt's wider miter range. 50 left and 60 right. Whereas the Hitachi is 45 left and 57 right. At 90 degrees the DWS779 can cut up to 16 inches whilst the Hitachi tops out at about 12.25 inches. Not only that it has a much more solid feel to it especially under a heavy load when cutting harder wood varieties. The Hitachi miter saw does however come with a 5 year limited warranty versus the DeWalt's 3 year. If you are limited on space in your wood shop then the Hitachi has a big advantage over lots of other miter saws in that it's slide rail eliminates the need for rear clearance. ​Easily the best miter saw for the money the DWS779 has bags of power and cutting ability. It can hit a no-load speed of 3800 RPM thanks to it's 15 Amp motor. ​The configuration is a double bevel sliding miter saw with a 12 inch blade. It has a miter range of 50 degrees from the let through to 60 degrees to the right. With double bevel capability it has a full bevel range of 49 degrees from left to right. The DWS779 uses a more traditional laser guide system than the top of the range DWS780. The DWS780 is priced significantly higher than the 779 and that price increase is really only for the addition of the XPS guide system that the 780 uses. The DWS779 is also backed by DeWalt's 3 year limited warranty. ​The C12RSH2 runs at a maximum no-load speed of 3,800 RPM just like the DeWalt. The speed is pretty much standard for a 12 inch blade. The Hitachi can cut 7-1/2 inch crown molding and cross cut at 90 degrees up to 12-1/4 inch. ​Probably the C12RSH2's best feature is the sliding rail system. Traditionally the slide rail systems on miter saw will end up requiring a lot of rear clearance for the saw head to move through it's full range. ​Hitachi have designed a slide rail that requires zero rear clearance, saving you space on your workbench. ​The D​W713 can spin it's 10 inch blade up to a no-load speed of 5000 RPM. It is effectively a single bevel miter saw as you only get between 0 and 3 degrees bevel to the right with a full 0 to 48 degrees to the left. The miter range runs from 50 left through to 50 degrees to the right. There are 11 positive detents at the most popular angles. The detents can be over-ridden for finer adjustments. ​Just like the larger C12RSH2 the C10FsHC also features the same zero clearance slide rail system, so you can fit the saw flush up against a wall or on your bench top without being too restricted by the depth of the saw. With a 10 inch blade and a 15 Amp motor we would really expect the maximum no-load speed to be significantly more than the quoted 3,200 RPM. ​Bosch 1617EVSPK vs DeWalt DW618PK two combination fixed/plunge based router kits going head to head. If you are unsure as to whether or not you need a fixed base or a plunge woodworking router for the majority of your work then the best option is to go for a combination kit. A combination kit gives you a lot more versatility than a stand alone fixed or plunge router. For the beginner it can sometimes be a little confusing as to when you should use either a fixed base router or a plunge router. The fixed base router really comes into it's own when you need to make highly accurate cuts that require the use of a jig. Although you could use a plunge router with a jig the margin for error is much higher. The fixed base router allows you to fine tune the cutting depth by 1/64 of an inch using a bit depth adjuster. 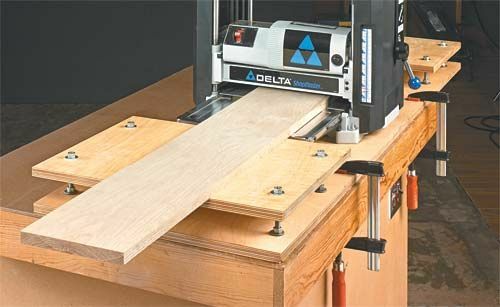 ​Most fixed base router are also designed to be easily mounted to a jig or onto a router table. The use of templates or dovetails require that the router is able to be mounted in a consistent and secure manner. The plunge router is used when you need to make cuts into boards that is away from any edge. The bit is "plunged" down onto the sheet surface from above. Just like the fixed base you can adjust the cutting depth however because you are pushing down from above to plunge the bit into the wood it may not always be perfectly accurate especially in harder woods. Plunge router are generally much more awkward than fixed base as they are a lot taller and generally more bulky. They also have a much higher center or gravity than a fixed base one. ​The 1617EVSPK is a fixed/plunge router combination kit that is powered by a 12 Amp 2.5 HP motor. It has a variable speed range of between 8,000 and 25,000 RPM. The motor is controlled by a variable speed dial so you can tailor the bit speed to the specific type of wood that you are working with. The motor also has a soft start feature and uses what is called Bosch's "Constant Response Circuitry" which adjusts the motor speed continuously depending on the material to maintain an exact RPM. The bit cutting depth can be adjusted in 1/64's of an inch increments on both the fixed base and the plunge base options. Both bases also have a bit centering system more better accuracy. To switch between either base just release the base clamp system remove the base and then switch it out for the other. Quick and simple requiring no tools. Included in the box: Motor unit, fixed and plunge base, chip shields, 1/4 and 1/2 self adjusting collets, bit change wrenches for 16mm and 24mm, T-handle wrench for height adjustment and a carry case. ​The D​W618PK is an combination fixed/plunge base router kit. Powered by a 12 Amp motor it has a speed range of between 8,000 and 24,000 RPM. If features variable speed trigger for easy speed selection and a soft start system on the motor to help reduce startup torque. Both the bases are adjustable in 1/64 inch increments. On the fixed base you get a micro-fine depth-adjustment ring and on the plunge base there is an adjustable turret stop for repeated cuts. Dust collection is by way of an innovative through-the-column system which accepts a standard shop vacuum hose. ​Investing in a good wood planer can save you thousands in lumber over the years. A planer gives you the ability to not only smooth out cheaper lengths of wood but to also recondition older more expensive cuts that otherwise might be thrown away. A bench top planner has the added advantage of not taking up to much room in a workshop but they are also easily transported around to different job-sites. 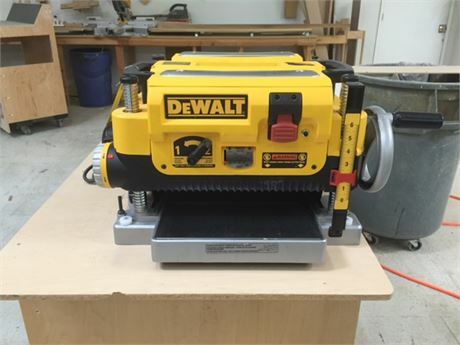 DeWalt are easily the most popular brand of bench top planers and with three similar models to choose from it can be a little confusing especially with the model numbers being so similar. The current range has three offerings the DW734, DW735 and the DW735X. ​Accepts boards 13 inches wide. ​Below​ you'll find a quick summary of the features and differences between the DeWalt DW734, DW735 and DW735X. The majority of the differences are between the DW734 and DW735. The DW735X is the same as the DW735 but it includes the feed tables and an extra set of cutter head knives. ​Across the three models the major differences are between the DW734 and the DW735. ​Although they are of similar power it is the carriage lock, cutting ability and knife size where the differ. Both models are powered by a 15 Amp motor. That motor spins up to a maximum speed of 20,000 RPM. At the cutter head however this translates into 10,000 RPM. The 2:1 reduction from motor to cutter head helps to increase the torque available to the blade giving it a better cutting ability especially on harder woods. The DW734 is a single speed bench top planer. A single speed planer will have only one infeed speed thus it will have a fixed CPI(cuts per inch). The DW735 is a two speed planer. Having the choice between a low and high speed gives you the option to tailor the cutter head to the type of finish that you want on a specific variety of wood. The two speed gear box allows you to select either a high or low setting. The low setting "2" will give 96 CPI which is good for coarser work and the higher setting "1" will give 179 CPI which would generally be better for finer finishing work. The DW734 uses a 12-1/2 inch knife whereas the DW735 uses a 13 inch knife. Originally it came with sharpen-able knives but now it is shipped with reversible disposable ones. The DW735 has a 13 inch knife head and also uses the disposable knives. The knife heads are reversible and DeWalt claim that they will generally last about 30% longer than other brands. ​A carriage lock along with properly set up infeed/outfeed tables is what helps ensure that you minimize the amount of snipe on the boards that you cut. Both the DW734 and DW735 have a carriage lock but one is manual and the other is automatic, each has their advatages and disadvantages. ​On the DW734 the carriage lock is manual. A manual carriage lock allows you to have better control over the locking mechanism, the disadvantage is that it is an extra manual setup step for every board. The DW735 has an automatic carriage lock. Although this means you don't have the same fine grained control over the lock it does eliminate an extra manual step which can be a real time saver if you are planing lots of boards. The DW734 comes with a set of infeed and out feed tables the DW735 does not. With the DW735X however you do get the tables included. Although not a huge issue there is a difference in the weight between the planers. The DW734 is the lighter model as you would expect weighing in at 80 pounds and the DW735 comes in at 12 pounds heavier at 92 pounds. The two models only differ by what is included in the box and the price of course. The X in the DW735X stands for eXtra's. With the DW735X you get the infeed and outfeed table and an extra set of blades. Although you can operate the DW735 with out the feed tables it will increase the risk of snipe along you boards especially for longer boards which will tend to bend easer than shorter ones. 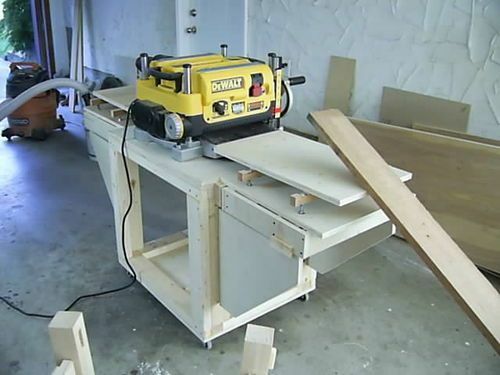 ​The D​W735X is a two speed bench top planer. It has a 15 Amp motor that gives a maximum blade speed of 10,000 RPM. At the lower speed you will get 96 cuts per inch and the higher 179 per inch. As stated above you get the addition of the feed tables in the 'X' package along with an extra set of blades. It has a maximum height clearance of 6 inches and a width of 13 inches. The cutting depth per run of the boards is 1/8 of an inch. The DW735 is the exact same planer as the X variation without the feed tables and the extra cutter. If you are on a strict budget and can set you planer up with custom made feed tables then it is definitely a good option. ​The D​W734 is the older, smaller and lighter brother to the DW735 model. It has a manual carriage lock and has is a single speed bench top planer. The infeed and outfeed tables are included in the box. On earlier versions the knife cutting heads could be re-sharpened however, on newer models the have the same disposable ones as the DW735. PFL Woodworking is a participant in the Amazon Services LLC Associates Program, an affiliate advertising program designed to provide a means for sites to earn advertising fees by advertising and linking to Amazon.